Recently, Hyperledger provided members the opportunity to speak with global analyst firm Gartner about experiences with Proofs of Concept (PoCs) and pilots using technologies from the greenhouse of Hyperledger projects. Given IntellectEU’s announcement today about the release of Catalyst, the first platform to integrate traditional infrastructures with multiple blockchain networks including networks built with Hyperledger Fabric, we decided to share the recent PoC using Hyperledger Fabric and Catalyst we discussed with Gartner. Implementation of Blockchain technology allows not only to reduce costs and facilitate efficiencies within enterprise ecosystems but also create entirely new revenue streams. The PoC was for a car insurance company. The objective was to use Hyperledger Fabric and Catalyst to create a flexible pay per mile insurance product based on the actual car mileage and condition of the vehicle. Catalyst served as the hub for connecting the insurance database, the car dongle (IoT device), end-user mobile application and Hyperledger Fabric itself. Catalyst listened to the changes on all the data sources and based on the business rules, applied the corresponding logic. IntellectEU deployed two smart contracts on Hyperledger Fabric; one to calculate the premium based on the actual car mileage and a second to confirm the payment. Catalyst has an architecture that is open, modern, and flexible and will be able to add multiple new players to the ecosystem in the future. Begin with a 2-day design thinking session, shaping and grooming the use case, and evaluating if blockchain technology brings significant added value to the use case. From those discussions, split up the business requirements into multiple use cases. Shape up the use cases to fit in the “fail fast” methodology. At this stage, select the initial use case to use as a base for the PoC. Create the Overall Design Document and the Functional Requirements Specification in cooperation with a customer. Develop the PoC using Agile approach. For more information, visit http://agilemanifesto.org. From this car insurance related PoC, there were two primary lessons learned that are worth sharing. First, it is important to determine at the outset whether using distributed ledger technology would give any boost to the use case. 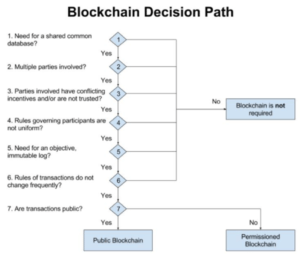 We have found that walking customers through the following “Blockchain Decision Path” is very helpful. Second, it was very important to have a specialist who understood General Data Protection Regulation (GDPR) requirements to ensure compliance. In brief, GDPR is a regulation that requires businesses to protect the personal data and privacy of EU citizens for transactions that occur within EU member states. It provides for a harmonization of the data protection regulations throughout the EU, thereby making it easier for non-European companies to comply with these regulations; however, this comes at the cost of a strict data protection compliance regime with severe penalties of up to 4% of worldwide turnover or €20 million, whichever is higher. GDPR will become enforceable from May 25th 2018. According to an Ovum report, two-thirds of businesses expect to have to change in their global business strategies to accommodate new data privacy regulations and more than half of businesses think they will be fined due to GDPR in Europe. A valuable benefit of being a part of the Hyperledger community is the opportunity to hear from members about their experiences “in the field” using Hyperledger technologies for PoCs, pilots and production deployments. We believe sharing best practices with the community helps the collective efforts to increase widespread adoption of Hyperledger distributed ledger frameworks.